I thank Marietta Eden for her assistance in turning my sketches and other figures into the illustrations for this book, and her hard work in this area is gratefully acknowledged. I thank the Australian Institute of Marine Science and the University of New South Wales for their support in providing me time to work on this project. By far the bulk of the work was carried out using published descriptions and illustrations, but I was kindly provided specimens of some species by Geoffrey Fryer, Ian Bayly, Brian Timms and Hákon Aðalsteinsson, and allowed access to work in progress by Sarah Adamowicz and colleagues. The latter were helpful given the continuing flux in the systematics of this group as more information becomes available from a variety of geographical sources, and as higher quality descriptions and more molecular data are obtained. I would also like to thank Carolina Bastidas, Penny Berents, Marit Christiansen, Nelida Contreras, Katerina Fabricius, Michael Kreutzen, Maria Schreider, Julie Thacker and Åse Wilhelmsen for their assistance with translation or other advice. The genus Daphnia is one of the most widely known groups of the freshwater zooplankton. Member species are used as fundamental models in teaching biology and are widely used as test organisms in toxicology. 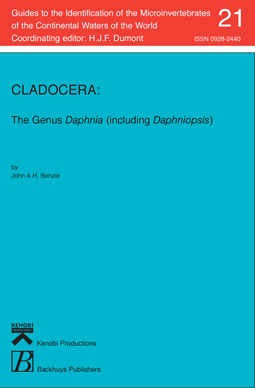 Classic work on genetics, evolution and population biology has been conducted using Daphnia species (e.g. see Banta 1939; Slobodkin 1954; Hutchison 1967; Hebert 1978a; De Meester 1996). The genus is most diverse and abundant in the temperate regions but is represented in all climate zones, and all continents, and is one of the dominant members of the world’s freshwater zooplankton. Despite this, the taxonomy of the group remains confused. The status of the most common taxa has been the subject of debate for most of this century. This state of affairs exists for several reasons. Body shape and other aspects of morphology are highly variable, and can be strongly influenced by environmental factors. The animals occur largely in lakes and ponds, and are often founded by small numbers of individuals. This can result in local differences in morphology among populations. Patterns of morphological and molecular genetic variation are made more complex as a result, and by the mating systems used in Daphnia species. Mating systems range from cyclic parthenogenesis (occasional asexual reproduction) to obligate asexual reproduction. Both types of reproduction can be found in different populations of one species. In addition, many species form hybrids with others. This already difficult circumstance is complicated by the fact that many early descriptions were based on one or a few specimens taken from a single or small number of sites. Further taxonomic problems emerged from the fact that many of these descriptions were superficial, and even detailed descriptions made today do not necessarily cover all potentially useful characters. A considerable effort made over the last twenty years in the molecular genetic analysis of extensive collections made over a range of geographical scales is now bearing fruit for the North American faunas, and is being extended to other regions. This work is introducing some stability into the taxonomy of the group. This is proving useful in determining the extent to which particular species are cosmopolitan, and the extent of regional differences in faunas. Molecular work is also highlighting the unreliability of some morphological characters used traditionally in Daphnia systematics. It has confirmed that members of the closely related genus Daphniopsis, are more closely related to other species of Daphnia than to each other. The validity of Daphniopsis has been questioned for some time and all members of that taxon have been placed in the genus Daphnia in the present work. Molecular data also show that some Daphnia species cannot be differentiated morphologically. It is clear that faunas in regions where there are no extensive molecular data will have unrecognised species, but also that some forms considered species today will prove to be intra-specific variants. The present work has focussed largely on published material in order to synthesise the present state of affairs, and provide a tool to assist the collection of more useful information for the continuing revision of the genus.